NETL researcher McMahan “Mac” Gray is a chemist at NETL where he conducts research on carbon capture and the capture of rare earth elements from liquid media. 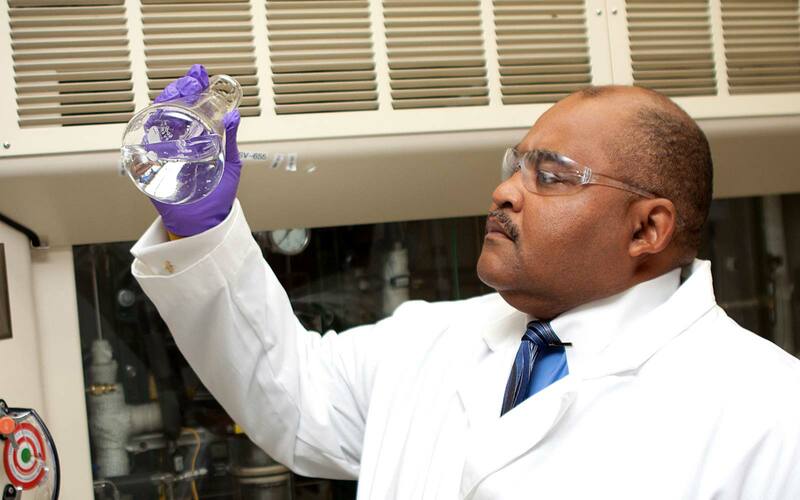 Mac is the inventor and principal investigator for the award winning basic immobilized amine sorbent (BIAS) technology—a breakthrough innovation that economically and efficiently absorbs CO2 from fossil-fuel-burning power plant stack emissions. The invention has attracted national innovation awards, including a 2012 R&D 100 award from R&D Magazine, and the 2011 Excellence in Technology Transfer Award from the Federal Laboratory Consortium. Mac has worked at NETL for 30 years, where he finds the creativity of developing practical and patentable processes for environmentally safe energy technologies to be the most rewarding aspect of his job. But Mac wasn’t always focused on energy research. Mac’s research career has been rewarding on both personal and professional levels. His work benefits the nation by developing technologies for a clean energy future.